1861-66 (1875 Re-issue), 5¢ brown, o.g., fairly light hinging, attractively centered amid large margins, rich vibrant color and sharp impression on bright paper, Very Fine to Extremely Fine; with 2014 P.F. Graded certificate (VF-XF 85, SSV $6,000). 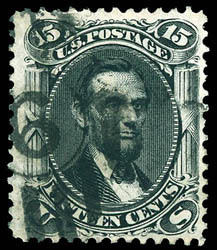 A BEAUTIFUL LARGE-MARGIN EXAMPLE OF THE 1861 5¢ RE-ISSUE. 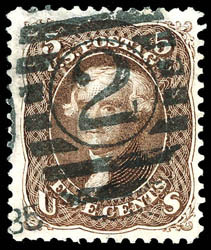 1861-66 (1875 Re-issue), 5¢ brown, duplex cancel, choice centering amid well balanced margins, bright vibrant color, Extremely Fine and choice, one of the few used examples of the 672 that were issued; with 1998 P.F. certificate and 2004 and 2009 P.S.E. Graded certificates (XF 90, SMQ $13,000). 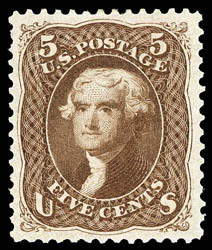 ONE OF THE FINEST USED EXAMPLES OF THE 1861 5¢ RE-ISSUE. 1861-66 (1875 Re-issue), 5¢ brown, gorgeous and rare used, neat bold duplex cancel, well centered amid wide margins, strong bright color on bright paper, Very Fine to Extremely Fine; with 1981 and 2014 P.F. certificates. 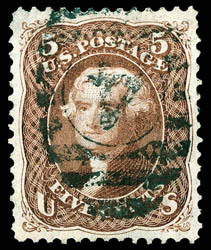 A CHOICE AND RARE USED EXAMPLE OF THE 1861 5¢ BROWN RE-ISSUE. 1861-66 (1875 Re-issue), 24¢ dark violet, full o.g., rich vibrant color on bright paper, choice centering amid evenly balanced margins, Extremely Fine and choice, certainly among the finest examples of the 346 issued; with 2015 P.F. Graded certificate (XF 90 XQ, SSV $12,000 for 90). 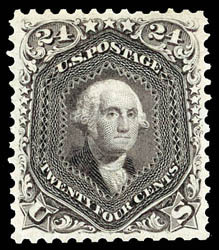 A WONDERFUL ORIGINAL GUM EXAMPLE OF THE 1861 24¢ RE-ISSUE, AN EXCEEDINGLY DIFFICULT ISSUE TO FIND IN SUCH CHOICE CONDITION. 1861-66 (1875 Re-issue), 30¢ brownish orange, without gum, rich deep color on fresh bright paper, perfectly centered, Superb, the only example to receive this grade with none higher, with only 346 issued; with 2010 P.S.E. Graded encapsulation (Superb 98, SMQ $10,500). WITHOUT QUESTION ONE OF THE FINEST EXAMPLES OF THE 1861 30¢ RE-ISSUE. 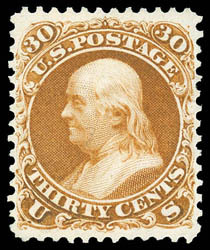 The 30¢ is one of the rarest of all the 1861 Re-issues and certainly one of the most difficult to obtain well centered. No other example, with or without gum, has received near this grade. With the next highest no gum example receiving an 85 grade and an o.g. example toping out at a 90 grade. We know of only one other example that comes close to being a truly superb example.